David formed the band in 2002 in the town of Sandviken. The band's vocalist was one Demogorgon and drummer was The Dying. In Aeternum released two rehearsal demos in 1992 and 1993, Domini Inferi and The Ancient Kingdom. In the summer of 1994 the band went through several line-up changes which left David as the sole original member. A new line-up meant a new promo tape in 1995 and more defections followed. David and Paul recorded a MCD called And Darkness Comes in 1997 and recruited new members which meant a contract with Necropolis Records and the recording of Forever Blasphemy at Studio Fredman. 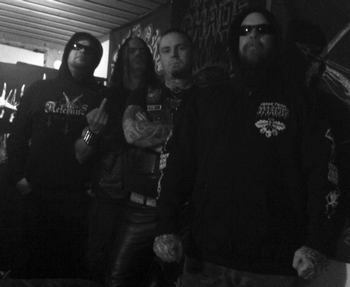 The Pestilent Plague was recorded in January of 2000 at the Abyss studios with Tommy Tägtgren. A band sampler was issued in 2002 through Necropolis and was called Past And Present Sins. Following the demise of In Aeternum the band signed with Agonia Records. A deal with Regain Records was announced in 2003, but soon rescinded. The band also contributed a song to a King Diamond tribute album. New drummer Karlsson used to run Heathendom Music. The group issued the EP No Salvation through Agonia Productions in 2004 and was contacted in 2005 by actor Mel Gibson's Icon Productions for supposedly using the cover artwork without permission. The EP was withdrawn and re-issued with a new cover sleeve. The band dropped its label, Poland’s Agonia Records, in the autumn of 2006 and accused it of being a scam. Pulverised Records issue the Curse Of Devastation EP in late 2007. It featured guitarist Erik Kumpulainen and bassist Claes "Clabbe" Ramberg. Years passed and a 2016 EP arrived, which was called The Blasphemy Returns. Joel Lindholm was also on guitar. Delivered from the city of the dead, here is a four man unit blasting forth in the tradition of Dissection and its black/death school of metal more recently delivered by Sacramentum and especially Naglfar. It is in deference to today's metal scene, that one can stand in awe of such ferocious blasting speed as In Aeternum deliver and yet feel little surprise or bewilderment. That is, it can only mean very good things when a band such as this can arrive upon the scene and while immediately displaying a gift for quality riffs, tight arrangements, meaningful solos and amazing power not be simultaneously considered exceptional or unique. This is certainly a testament to the quality of today's metal scene. Crystal clear sound delivered by Studio Fredman, the quartet lurch for throat in the name of true metal as only Swedes can deliver. No Major complaints here for an album that will surely be beyond adequate for any follower of Centinex, Naglfar and Taetre. My sole (minor) beef would be the beginning of song two where the music seems to skip due to mistaken mastering or duplication post production. Yet once again I stand in awe of the majesty of heavy metal. - Ali "The Metallian"
One would think that with titles like The Apocalypse Division, Eternal Devastation (not related to Destruction) or Revelation of hell there would be no way to go wrong. The fact is, however, that our Swedish trio sound slightly redundant despite all the speed, heaviness and fury built into this digital demon. It's as if no matter how hard they lash at us the body's gone numb and refuses to believe in pain. It's all properly Swedish, heavy, aggressive and growling, but you just can't avoid that certain feeling of deja vu which tells you that there is little new transpiring here. That is the gift of Sweden: this single country has raised the international bar for heavy metal to such an extent that an album like The Pestilent Plague passes by with nary an impact. - Ali "The Metallian"
As evident from the title, Past And Present Sins is a sampling of In Aeternum tunes from days past to 2001. What the tracks show best is the band's progression. While tracks from 1995 or 1996 might be adequate, it is Cursed Legions (recorded April 2001) which takes the cake with a massive death metal attack laden with piercing riffing and a barrage of drums. It is reminiscent of Necrophobic. If this is the Swedes' direction then the band is sure to move up a notch or two in rankings among metal fanatics. As for purchasing the album, with four live tracks, two covers (this is where it falls apart for me) and miscellaneous recordings the choice is bleary. The sound varies, the presentation fitting and fashioned after old eighties thrash LPs with its photo collage and a total of 14 songs on what Necropolis graciously calls an EP. - Ali "The Metallian"
One again, kudos to Singapore’s Pulverised Records for releasing music like this and taking a chance on underground EPs. Curse Of Devastation is a four-song mini-CD book-ended by Reaper In Black 2006 reworked here from the original version, which appeared on 1999’s Forever in Blasphemy full-length.